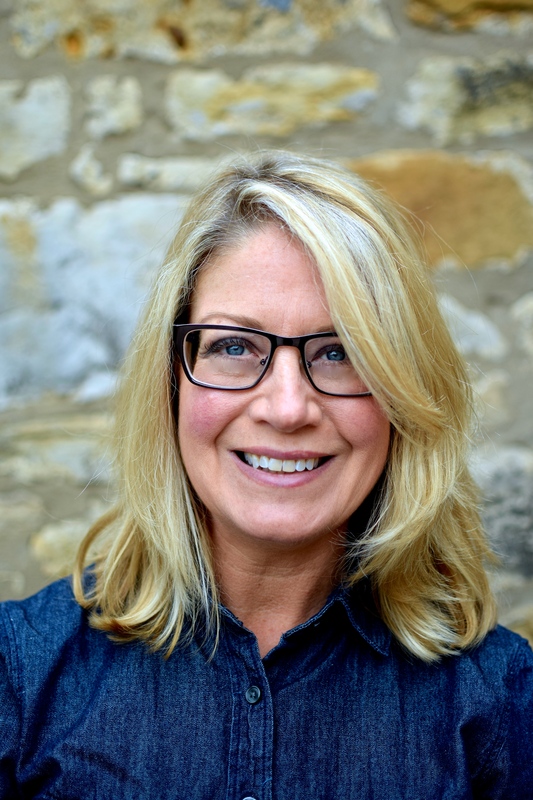 I’m hunched over my laptop while the rest of Edinburgh – and many thousands of visitors – are queueing for some of the 2542 different shows on offer during the three weeks of the Edinburgh Fringe. Like the original, more high-brow Edinburgh International Festival, ‘the Fringe’ is part of 11 official festivals that pop up annually in Edinburgh – six during the peak tourism months of August and September. One of my favourites is the Mela, a smaller southeast Asian festival with an international flair. You can watch flamenco, bhangra, African drumming and capoeira while munching on mainly Pakistani and Indian delicacies and waiting for a sari fashion show to start. Multi-culturalism at its most accessible. But the Fringe – officially the largest arts festival in the world – is arguably the best known and best-loved of all the festivals. Comedy is definitely king in this city but serious and not so-serious theatre, music of all descriptions, poetry readings, children’s shows, cabaret, dance and physical theatre are all here as well. And you can see something almost 24/7 – great if you are jet-lagged and have no idea what time, or even day, it is. during these three intense, and at times overwhelming, weeks. Perhaps they have been inspired by the likes of Hugh Laurie (House), Rowan Atkinson (Mr Bean), Steven Fry (polymath) and Emma Thompson (Oscar-winning actress etc), among many others who were talent spotted in this very city. Even if you never make it to a show (and locals complain bitterly in the local paper about the ‘London prices’) it is a must to at least wander around the Old and New Towns celeb spotting (John Malkovich two days ago) and watching the brilliant (free!) street performers and their eclectic audiences. It’s a real spectator’s paradise too, watching all the Lady Gaga-wannabes, perambulation-challenged fashionistas (which is amusing, as it almost always rains) and the period-costumed performers catching buses and hailing taxis. Maybe when I finish writing this up I will grab my umbrella and go do some celeb-spotting myself. But first, the salmon. As usual this recipe has not a jot to do with my rambling preamble but I felt it my civic duty to boast of my adopted city’s most famous event. Perhaps I should have found a play about fishermen to highlight. And it would have been very apt if Salman Rushdie was speaking at the Book Festival, but alas he is not. This is the companion recipe to the Tamarind Prawn Summer Rolls one I featured three posts ago. Mr A and I were in savoury heaven with the combination of these two dishes, even fighting over the remnants of the almond sauce, as I recall. This recipe is less ‘hands-on’ than the former, although both are very easy. Just a little chopping and marinating. I cooked it on a hob-top ridged griddle pan, but I double-checked barbeque directions for those of you who like the outdoor cooking thing – reckon on 3-and-a-half minutes per side, but check here for specific cooking instructions. Nutrition Notes: Time constraints have put the brakes on exploration of the nutrient goodies that lie within some of my recent recipes’ key ingredients. But today I have some interesting information for you to chew on and consider. I give you the phytochemical powerhouse that is curcumin. The essential fatty acid Omega-3 found in salmon is also a potent compound, but I will save exploration of it for another time. If you can’t wait, here is a good overview from Memorial Sloan-Kettering Cancer Center’s excellent ‘About Herbs’ database. There is so much burgeoning data on curcumin that I will have to limit myself to the highlights. Much of what we know about this exotic compound comes from animal studies and human cell culture studies, so enthusiastic extrapolation is unwise. But caveats aside this looks to be a very promising preventive and therapeutic plant chemical. Curcumin, one of the main active compounds in the brilliant yellow spice, turmeric, has been used medicinally as far back as 3000 BC. A staple spice in India, turmeric has only in the past 30 years been used more widely in the West, perhaps most notably in multi-cultural Britain where Indian and Pakistani food is popular with all ethnicities. Current scientific interest in curcumin as a cancer-fighting food comes from awareness of its use in Ayurvedic medicine to treat diseases and conditions associated with digestion, the skin, the liver, joints and infections. Curcumin’s anti-inflammatory properties are perhaps the most studied of all its potential benefits. The Chinese use turmeric for similar ailments. As with many plant-based medicinal compounds, the East leads and the West follows. The anti-cancer action of curcumin is well-established in animal studies and in human cancer cell cultures. Lab findings point to curcumin’s ability to prevent tumours induced by carcinogens (cancer-causing substances) as well tumours that occur spontaneously. It may be that in the not-so-distant future curcumin may be used to help prevent and treat cancers of the stomach, intestine, colon, skin and liver: curcumin’s effects are seen in both the initiation and promotion stages of cancer. In studies of human cancer cells in the lab, results are just as exciting – curcumin blocked the growth of cells from colon, breast and ovary cancer cells, as well as leukemia cells. This seems to be due to two actions: apoptosis – inducing cancer cell death, and preventing angiogenesis – the formation of new blood vessels. Cancer cells can’t get energy to grow if they don’t have blood vessels. Currently there are four large clinical trials through the US National Institutes of Health looking at curcumin’s effect on pancreatic cancer, multiple myeloma, colorectal cancer and Alzheimer’s disease. Watch this space. 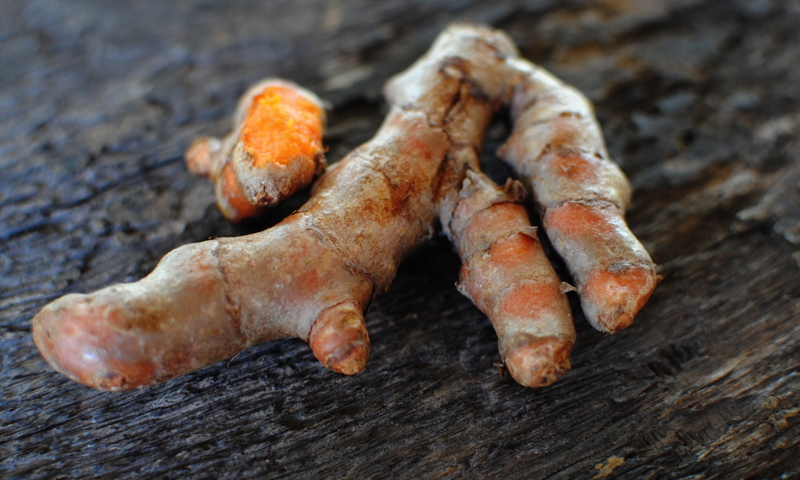 There are a few people who shouldn’t consume turmeric: breast cancer patients receiving chemotherapy – animal studies show it can block some drugs; those with liver disease; those undergoing surgery (it thins the blood); and those with bile duct obstruction. A full list of contraindications are listed here, where there is also an excellent overview of this compound. One last point, and an important one: our absorption of curcumin is greatly enhanced by having it with black pepper. So the next time you make a curry – or even buy one – add some pepper for extra punch, and benefit. There are other interesting ‘culinary synergies’ worth exploring. See my article for further potent food partnerings. If you are really interested in the key foods that may help prevent and treat cancer, I recommend reading Professor Richard Beliveau and Dr Denis Gingras’s book “Foods To Fight Cancer“(DK, 2007). Turmeric is their top spice and oily fish is their top protein. 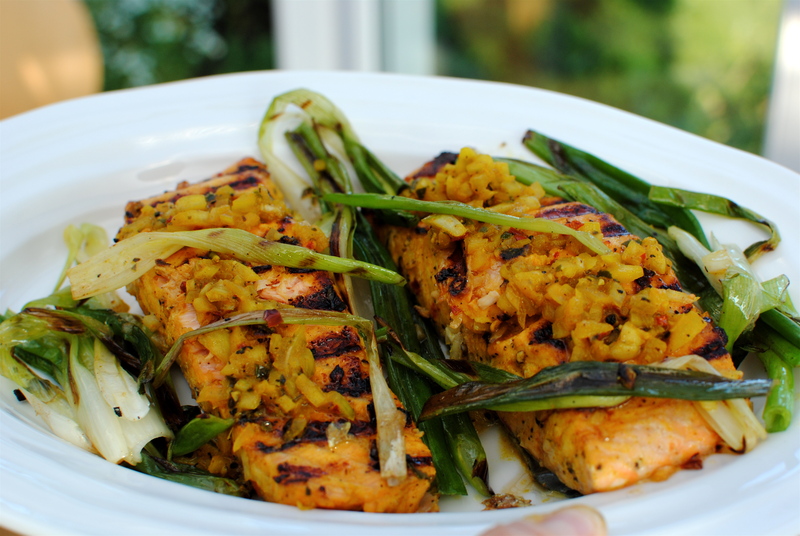 Salmon itself is a superb food, but marry it with lime AND turmeric and you have a delicious, super-nutritious meal. Quick too. Unlike marinating meat or chicken, marinating fish is nearly always speedy – leave it too long and citrus or other acidic ingredients will actually cook the fish. So, here you get the soak-it-up yum factor of marinating without the wait– or the planning ahead. That last point is the seller for me – besides the taste, of course. Another plus point is that this recipe is easily doubled, tripled etc. A word about the lime leaf: I think it really makes this dish, but if they are hard to get use zest of ½ a lime for each recipe. I keep a bag of pre-chopped lime leaves from Waitrose in my freezer and use it in all kinds of things: rice (as below), stir-fries, Asian style soups. It might even be nice in some kind of muffin. I’ll have to try that! I’ve not used the freeze-dried stuff, but I never had much luck with freeze-dried herbs. Asian markets will be your best bet for fresh lime leaves but just use zest if need be. 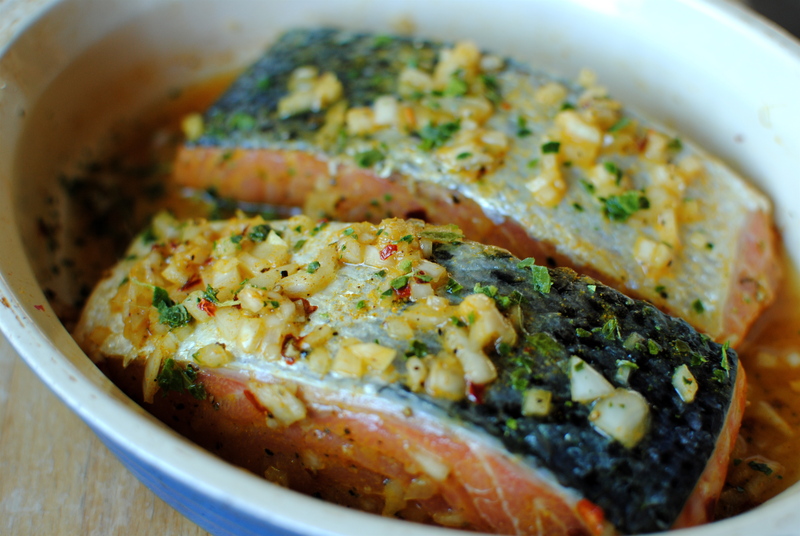 Mix the marinating ingredients together in a dish that will fit the fish snugly. Add in the fish and turn a few times to coat. Cover the dish with clingfilm and let the flavours meld for 20 minutes. If you want to do this on the barbeque, depending on what type you are using, get that going in advance. For a hob-top griddle pan, heat this a few minutes before the marinating time is up. You want it good and hot to reduce the chance of sticking. While the fish is marinating, add 1 tsp of oil to a hob-to-oven pot and heat on low-medium: a cast-iron Le Creuset type lidded pot is perfect. Pour in the rice and sauté for 4-5 minute, stirring occasionally. It will smell nutty and delicious. Add in hot vegetable stock and the lime leaves, pop on the lid and allow the rice to come to the boil. If you don’t have such a pot, do it in a normal saucepan and scrape the rice into a lidded casserole dish and pour over the hot stock. Place the dish/pot in the oven and bake for 15 minutes. You will get very fluffy rice with no nasty overspill. I always cook rice in the oven. A trick my mom taught me. Brush off the marinade into the dish for using in a few minutes. Slick the fish with a little oil and slap the fillets on the griddle pan or the oiled surface of your barbeque. Pop on the spring onions too (do these in a pan if you are barbequeing). Toss them around to get even softening and colour. Cooking times for the salmon are a bit tricky to give as fillets vary in thickness, but my fish pieces were about 3 cm thick and I cooked them for four minutes on each side. This gave me cooked through fish, but with a soft interior. Test for your own doneness though. Plate up the fish and spring onion, and serve with the rice and maybe something like steamed broccoli or a sauteed Asian greens mixture. If you like, boil up the marinade mixture and pour it over the griddled fish. We had this with my Tamarind Prawn Summer Rolls as a starter and were in savoury, tangy heaven. 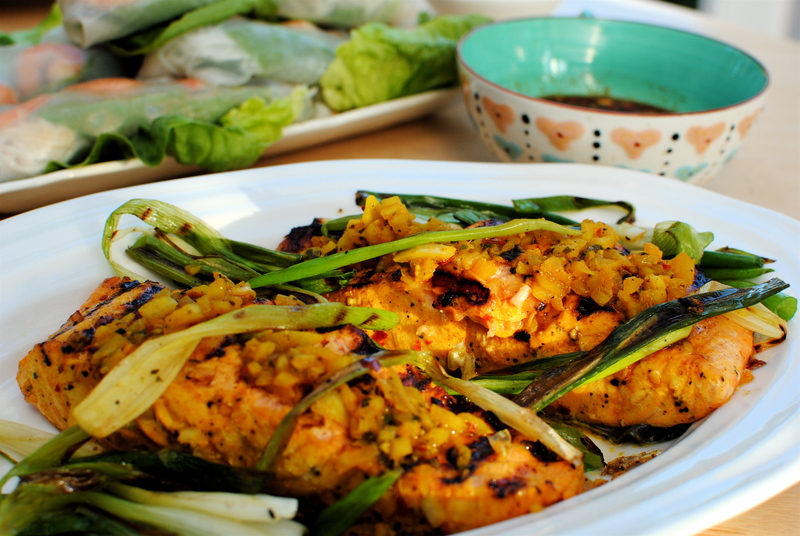 Fabulous salmon with lime and turmeric in the marinade. Salmon is in season here in California. This is a perfect recipe for me to try soon. Enjoyed the nutrition notes! Thanks for sharing. Glad you like it, Deb. My preference is Pacific salmon (Shh, don’t tell anyone) as it is a ‘cleaner catch’ so I am a wee bit jealous if you try this with your local salmon. Please let me know if you try it; I’d love to hear your comments/suggestions and if you try it on the BBQ. Fantastic salmon. I even have the turmeric I need to make it. I love it when that happens! Have a good weekend! Yeah, I love it when that happens too. I use turmeric a lot – salad dressings & tea as well! Hope the recipe is yummy for you. Will you BBQ it? Have a lovely weekend. Thank you Jackie. 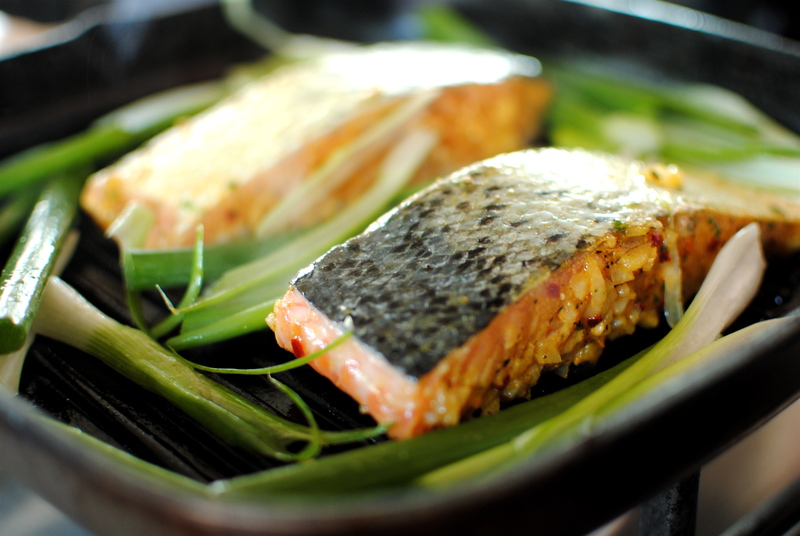 Good salmon is always tasty no matter what you do to it, but I think this one is a nice little recipe for when you want it a bit zingy, but not spicy. And the baked rice is much the easiest way to cook it, in my opinion. You can walk away and not worry about the dreaded boil-over, and gungy hob. I cooked this tonight. And it was utterly delicious! Thank you for sharing the recipe! I tried making the rice this way using brown basmati rice – I used 350ml of stock and it came out quite fluffy but still very al dente – I think it needed either more stock or longer cooking (I gave it about 20 mins), what would you recommend for cooking brown rice in the oven? Thanks for the lovely comment and feedback. I have been making variations of this for about 20 years. As for the brown basmati, I tend to cook it for up to 40 minutes with maybe 1/3cup more water a for 4 serves, checking at 35. Hope this helps. Do you mean a 1/3 cup more than 350 ml? Thank you!